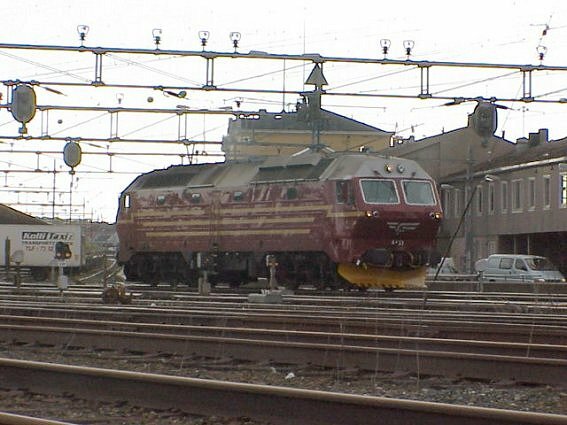 This was a sight to see, with every inch shaking the venerable Di2 was switching sleeper cars at the Trondheim. 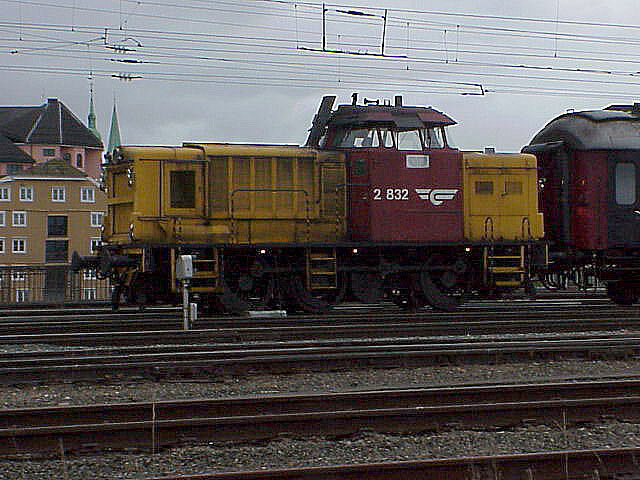 The Di2.832 would be in the finals of being the loudest diesel in the NSB fleet. 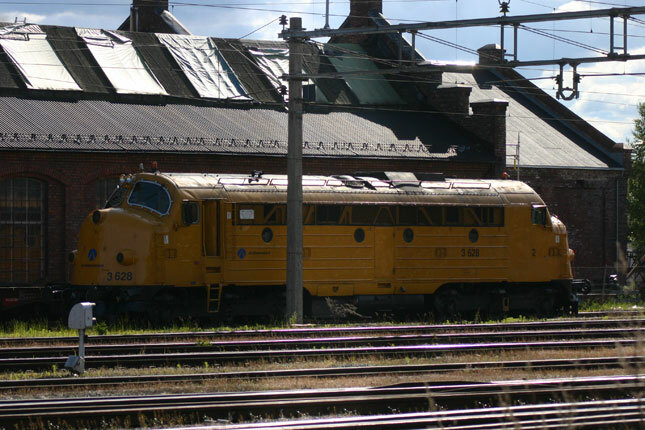 It is somewhat supricing to see these engines near their 50.th birthday still in use today. 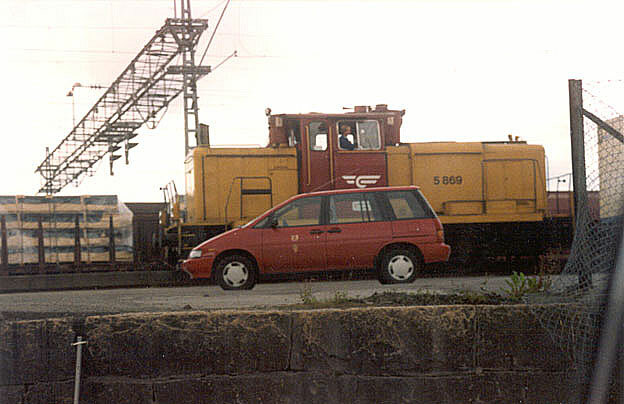 Note the repainted but leased SJ sleeper car in tow. 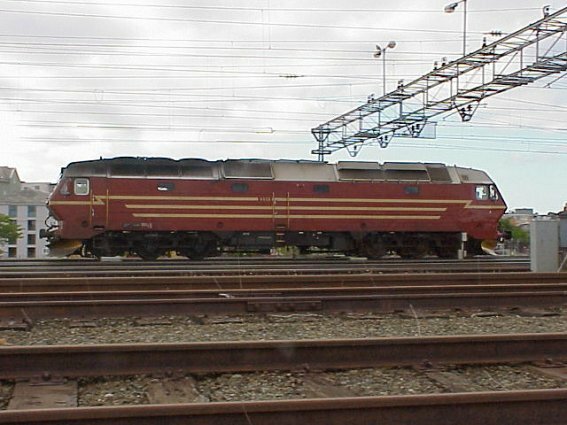 28-08-2003. 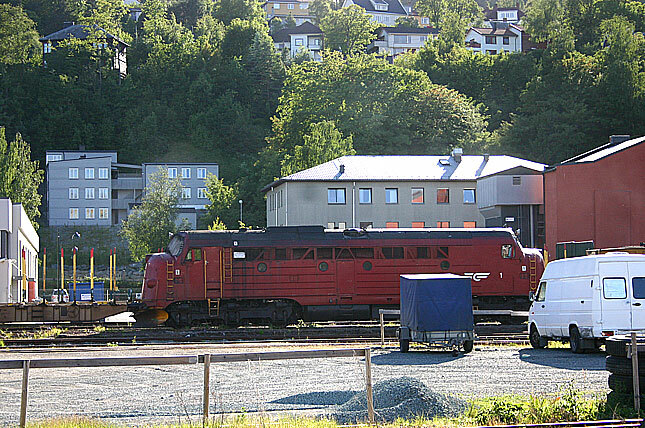 If you are in Trondheim and being a railfan this one engine is hard to miss. It is shuffling around passenger cars everywhere in Trondheim. Still shaking and rattling like any rock star from midfifties it still handles its duty rather well. 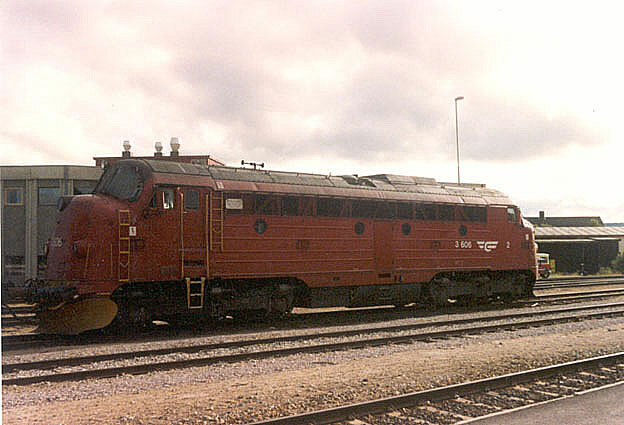 Note that this engine is still a NSB property and perhaps one of the very few NSB units in this color. 5th of June 2005. Still a year later the vetran diesel is busy and shuffeling cars around from Trondhaeim to the washing racks at Marieborg. 2004-06-01. 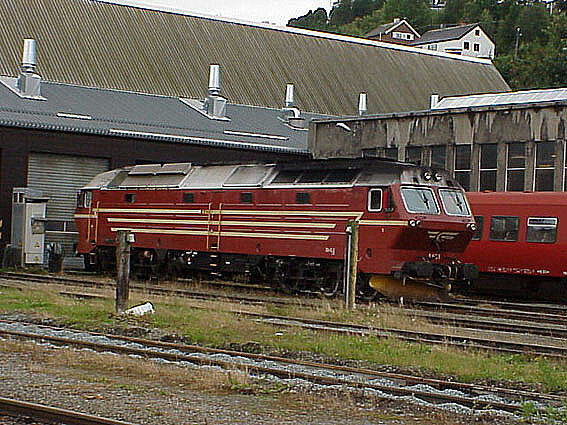 Di2.842 at the engine shops in Trondheim 28th of August 2003. 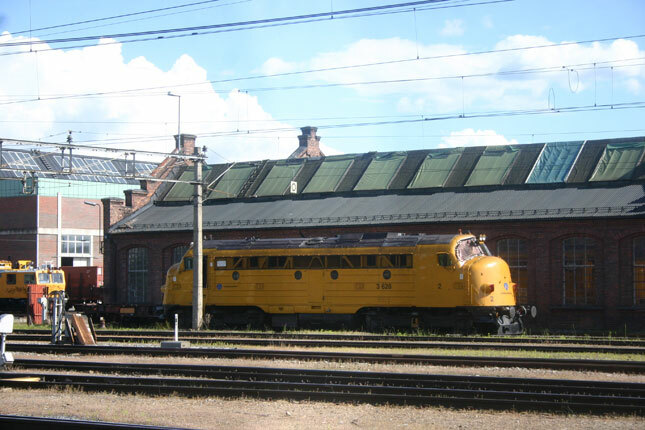 The different lettering of this engines is probably to do with that the engine is used as a shop gaot at the Marieborg shops. 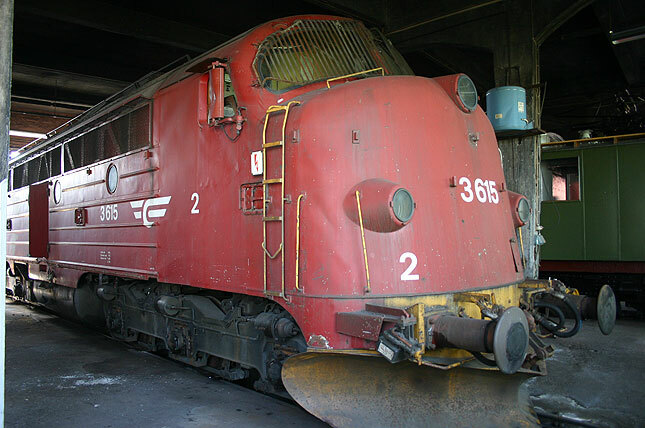 At what appears to be the deadline at the Marieborg terminal, the Di2.851 is sitting next to engines that are waiting for their disposal only after 1/10th of years of services provided by a Di2. 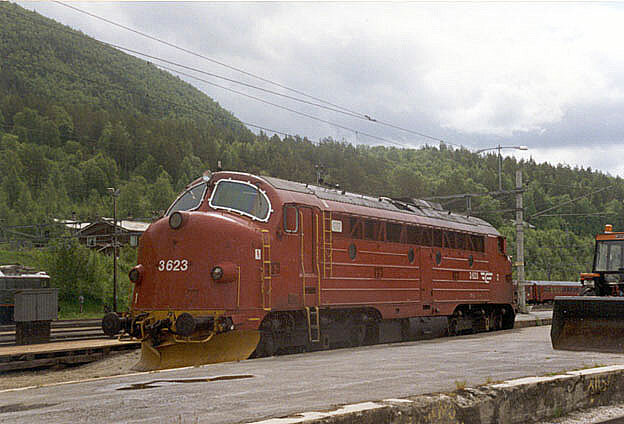 Di2.854 in Dombås June 1995. 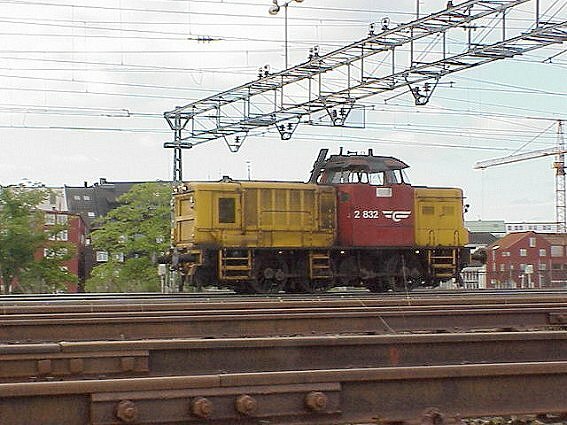 The D2.s are still used as switchers and this livery is applied on all hood units of NSB, as Di2.s, Di5.s Di7 and the Di8.s. After the made over to old days, the star of the 150 year celebration spend its day om excursion runs and been tkaen care off in the round house of Hamar by the owner GM-Gruppen. 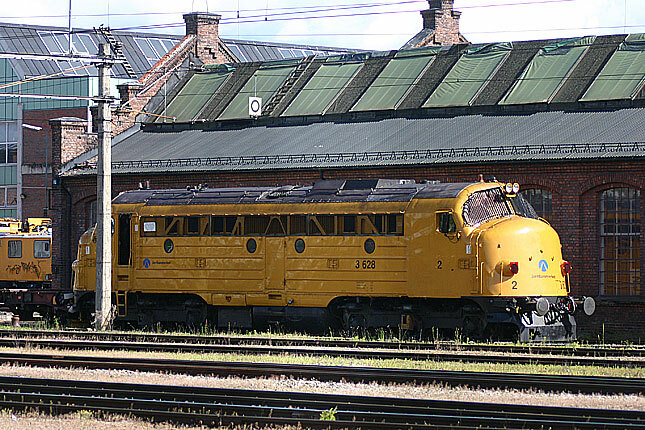 To make the Di3.602 even more interseting is to see its stable mate a restored MY 1105from the Danish National Railways (DSB), now also owned by GM-gruppen. 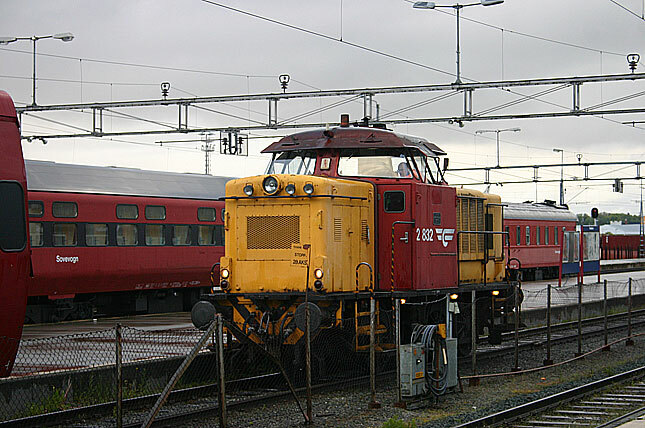 Hamar 2006-08-31. 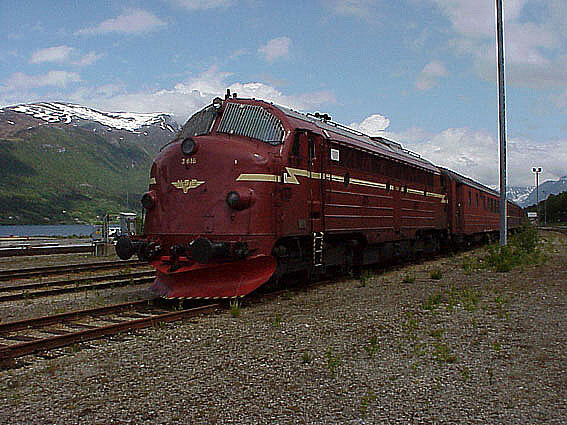 The summer is over and the venerable Di3.602 has hault tourists and railfans all summer between Åndalsnes and Bjorli. 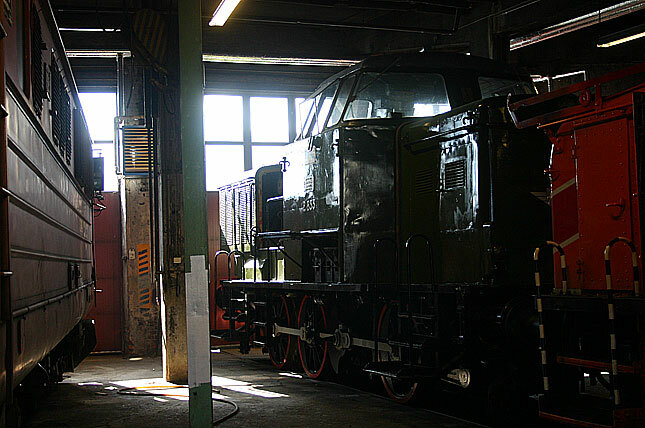 But now the season is over and the old diesel is back in Hamar to see some service before being stored over the winter at the round house. 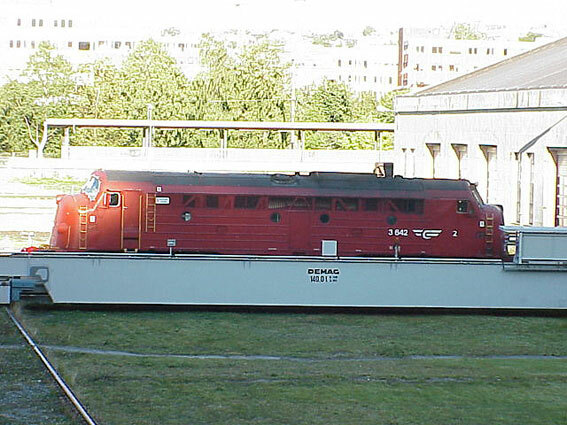 One of the most famous motive of power in Scandinavia are the NSB Di3.s and the DSB.s MY and Mx.s There was the poll in a Norwegian Railfan magazine of which was the most popular engine models run in Norway, the winner by far were the Di3.s. 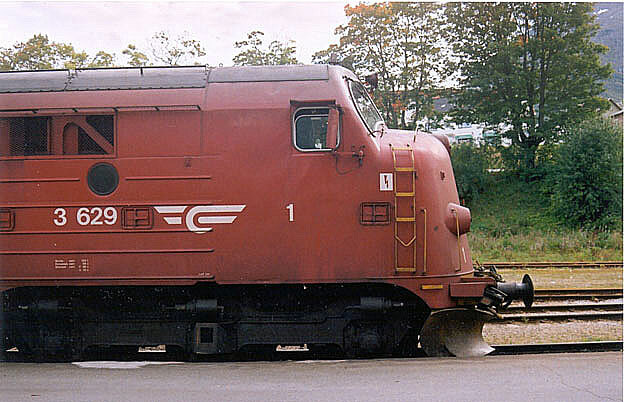 My earliest enconterment with these were in 1973 in Mo i Rana where I saw one decked with a large nose decal. Twenty years later, in Röros I had a chanche to take my first own pics on the engines. 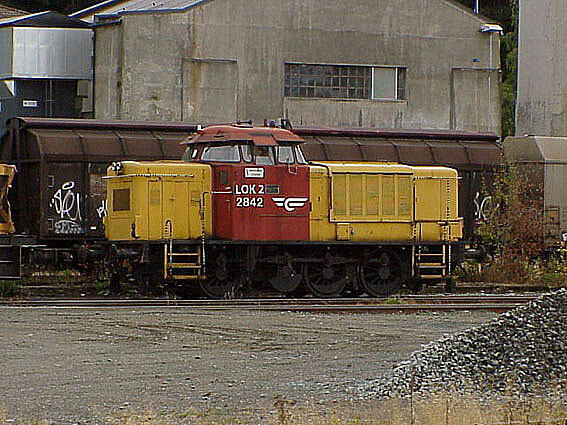 The 3.606 in the new scheme is sitting pretty in the yard. 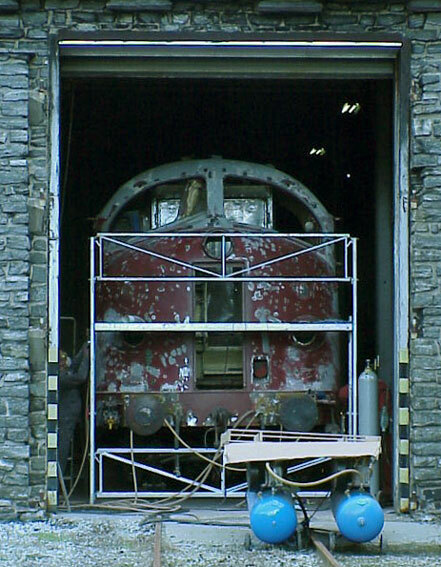 Note that the cab rebuilding had yet not carried out on this unit. 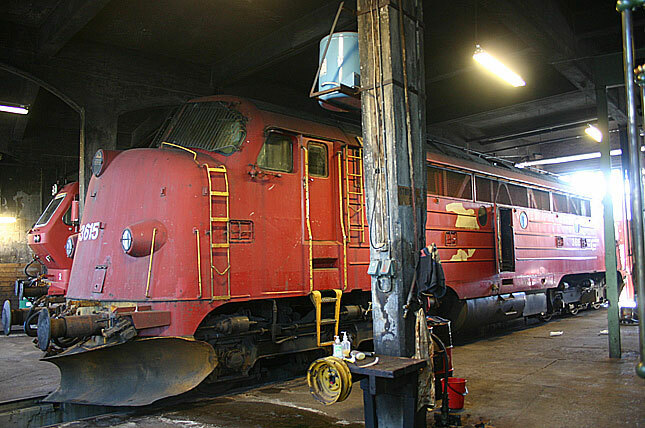 This unit is planned to be parts donar to keep Di3.602 and di3.617 running but what I hear is that the engine itself is in very sound condition and might make it as preserved unit too. The first image 2006-08-31 and the second image 2007-06-16 Hamar. 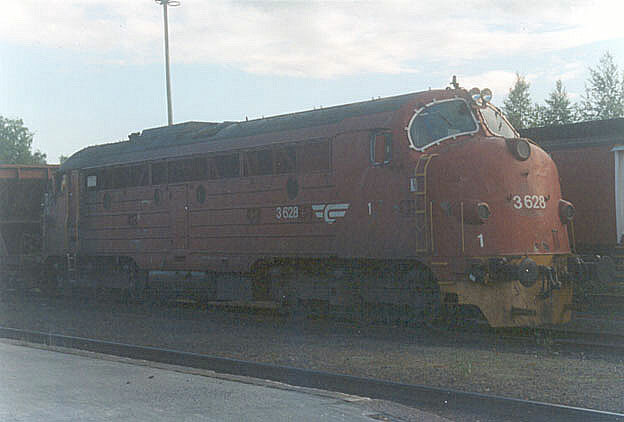 The 3.616 is now repainted to earlier redbrown with buff stripes scheme and used by GM-gruppen as their power to their excursion trains. 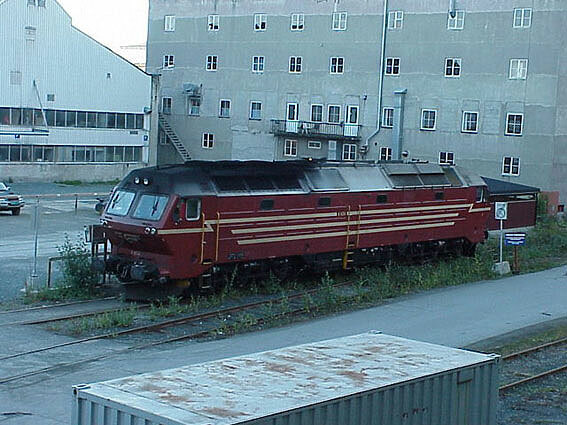 Though, I did not feel it while shooting few shots of the unit in Åndalnes in May 2003, it brings a bit of memories as I recall the first time I saw a Di3 in Mo i Rana in easrly seventies, the engine the number I can not recall, however sorted a large heralds on its front. Awesome!. 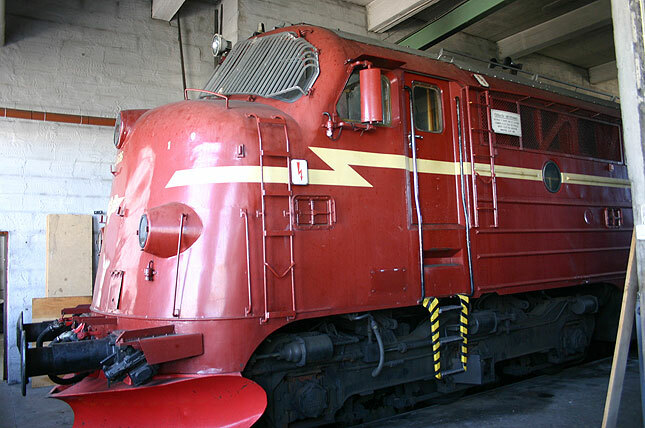 The roundhouse of Hamar has many treasures in form of railroad equipment, one is the preserved Di3616, decked out in the classic paint and details from mid sixties through the seventies. 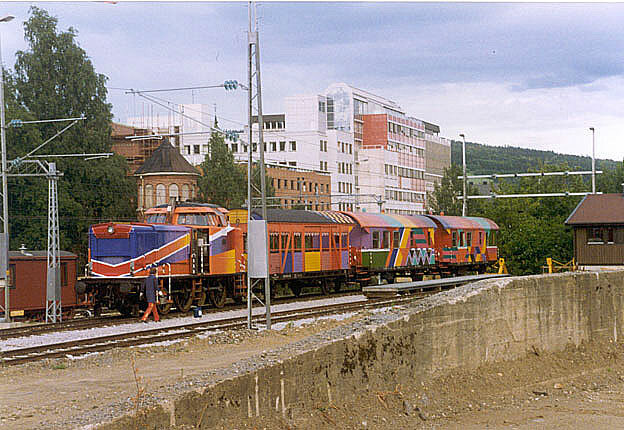 The 3.617 at Trondheim is heading the final yards to the platform with another consist of a Rörosline passenger trains in sunset in summer 1999. 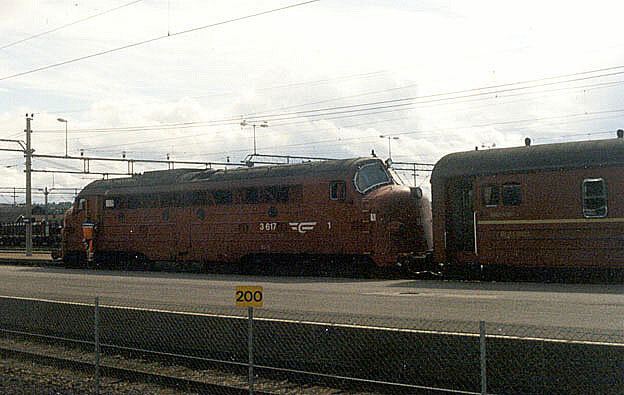 The shot of this engine in Hamar was taken a year after on train for the Rörosline, note the combination that wears a oldscheme but the doors are repainted according the "new Design" in to black. I did not realize that this would be my last picture of Di3.s on regular duty. 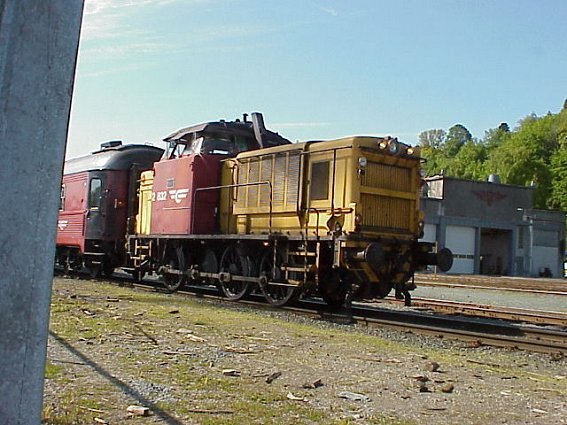 As the set with Di3.620 crept to the waiting freight southbound. 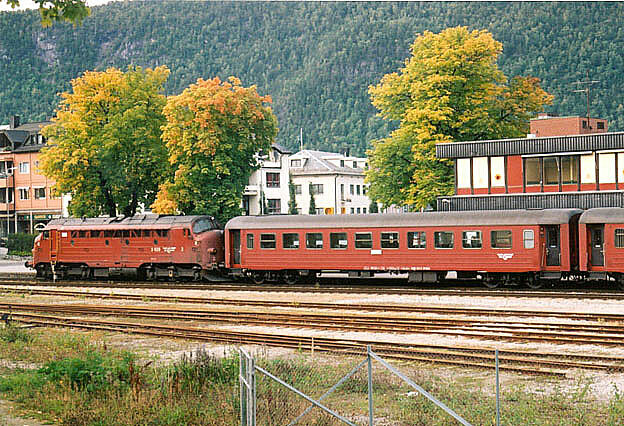 One of the sites that strongly tied to Di3.s is Dombås, which is the eastern terminal of the Raumaline. 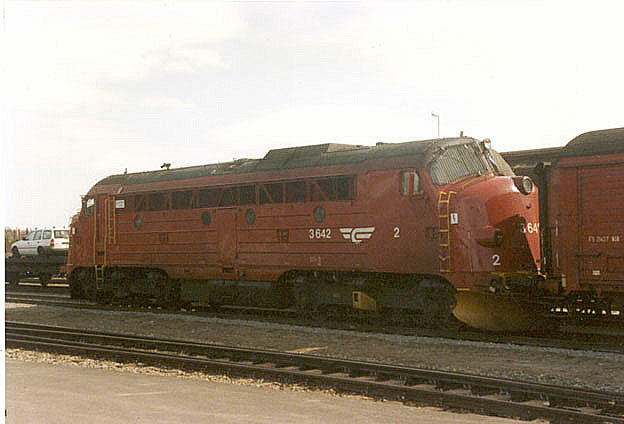 This is my favorite on Di 3 shot, on 3.623 parked on the track near the platforms in 1995. 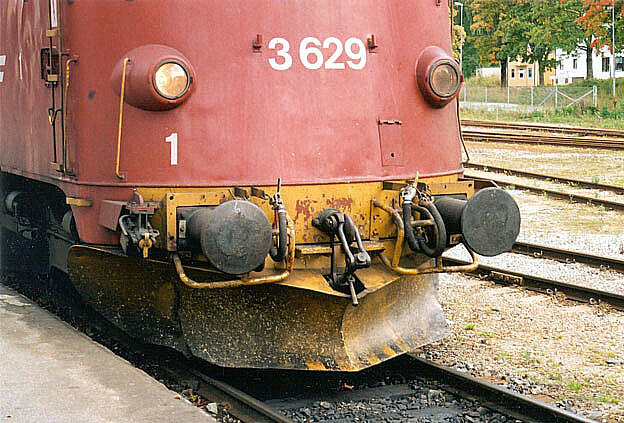 What difference a decade or so can make, NSB had written off its fleet of Di3.s and scrapped most of them. 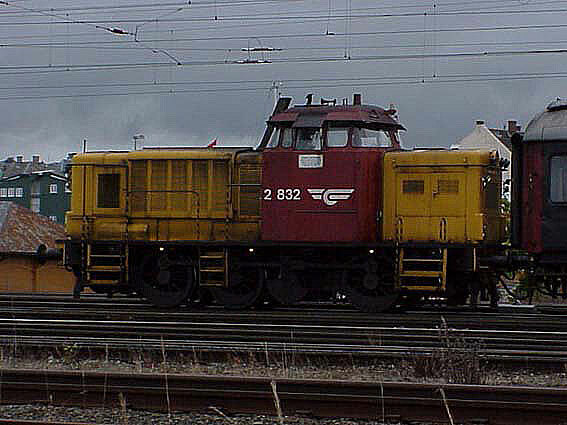 In June 2007 some 12 years later to image above, the Di3.332 has found a new owner and now has new paint aswell. No trip to Norway is complete without a climpse on a handsome and legendary Nohabs. 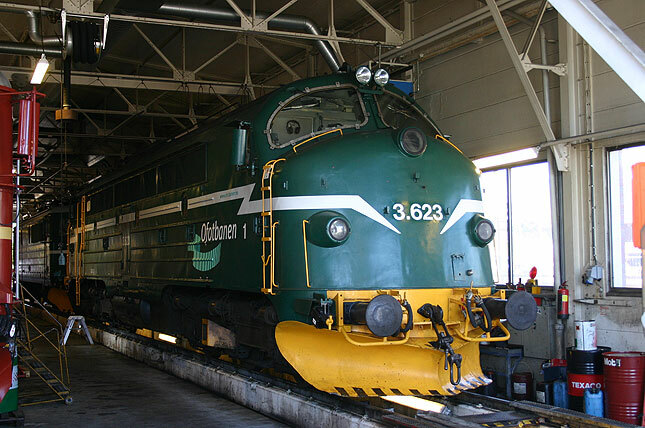 Here Ofotenbanems Di3.623 i is showing its nose in the companys diesel house. I guess it is a hight time for the company get those windows washed. 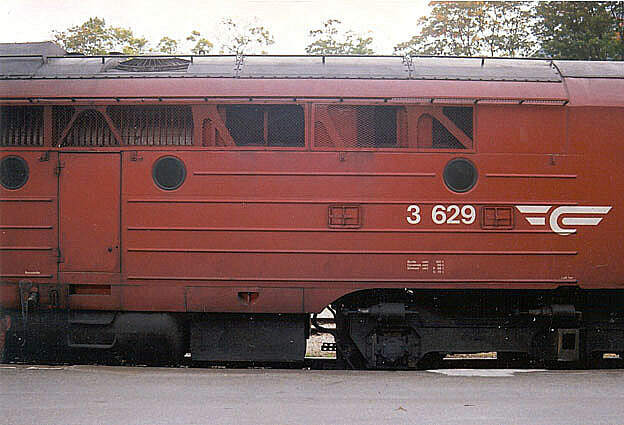 The Di.3 3628 was not among the engines that were either scrapped, sold to Italy or given away as aid to Kosovo. 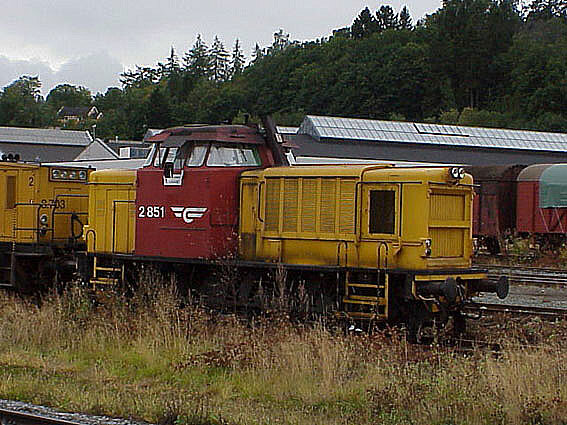 Instead transfered to the Mow duties, loosing its NSB logo and the snowplows. Photo summer of 2002 in Elverum. 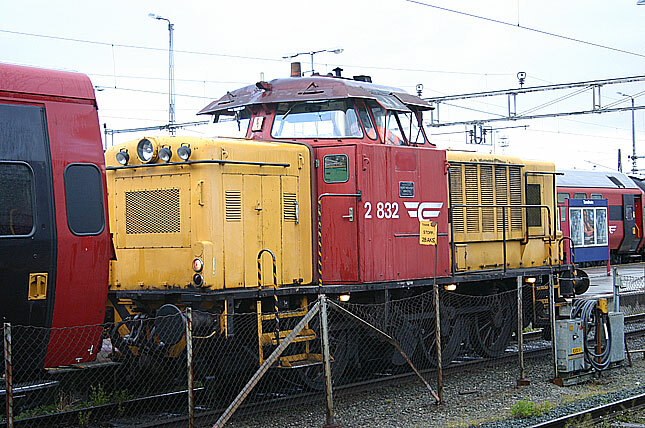 It is mid June of 2008 and Di3.628 is repainted in MoW yellow and still some 50 years after the Di3.s were introduced the Norwagian rail roads still needs these handsome NoHabs. 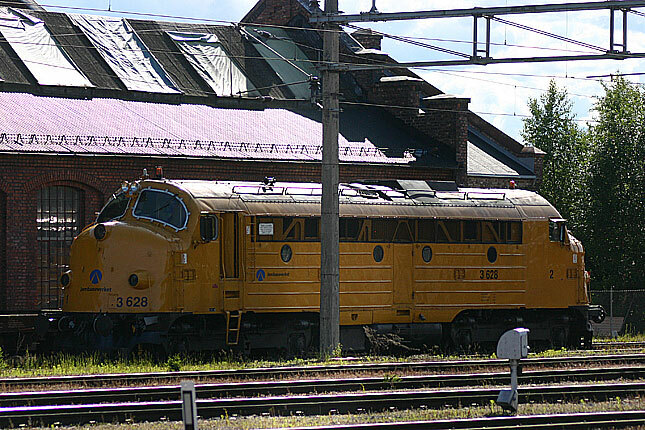 The Di.3 3629 was still busy on the Raumaline during its final year of service on the passengerruns. In the freights the Di3.s were bumbed by the new centercabs of D8.s and in this final year they show how weary looking a loco can be as the maintenance consisted mostly on patching up and keep them running. The passenger runs consisted to daytime trains and the consists was ab BF14 combine and a pair of B3.s all decked with destiantion boards. 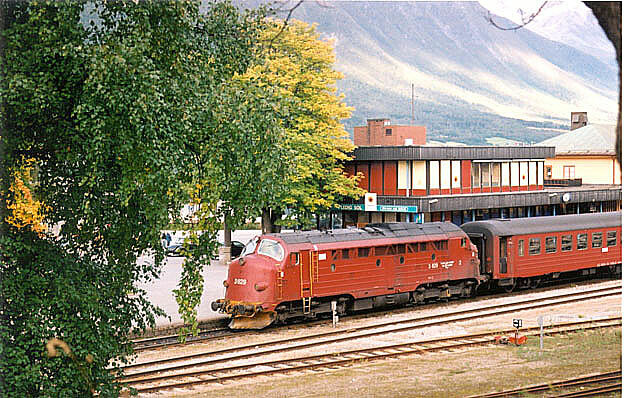 The Images are taken in and around Andalsnes in July 2002. 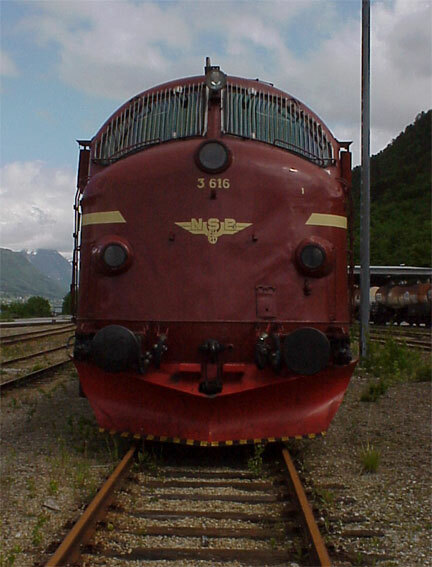 Overall look on the details of the right side hood, while the engine was sitting in Åndalsnes. 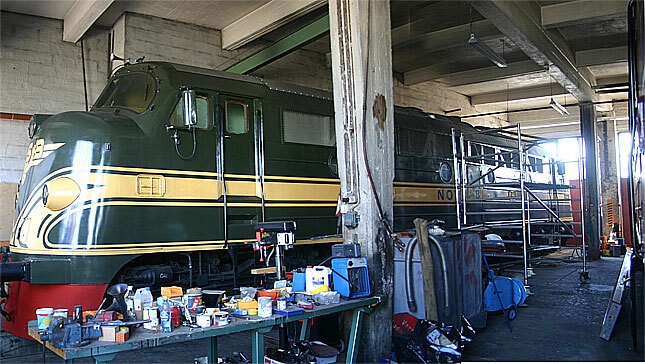 These serie of images gives a general idea of weathering it the last year of service. 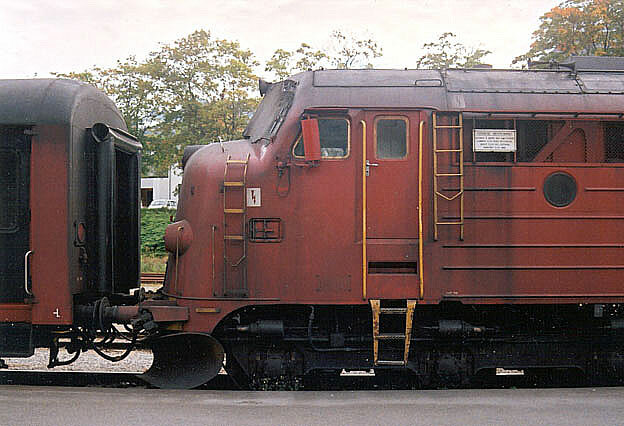 Another noteworthy common among the Di3.s is that the A-cab is rebuilt with new armour class windshields and new side windows, while the more seldom used B-cab retains more or less orginal looks. Truck and pilot detail of the very same unit. 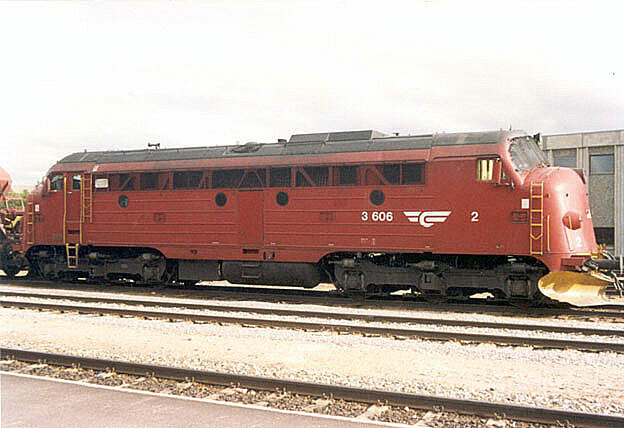 In the late 1990-es the Di3.s appearently were use on weekday morning trains from Otta to Oslo. As seen on this sunday pic from Otta, with a typical mix of cars in various schemes from that era. The Röros line was also a stronghold for Di3.s for years, in middle of lull of on going rainstorm Di3.630 is about to arrive to Röros on its trip northbound to Trondheim. Photo of this taken in 1998. Once a while you get a lucky shot. 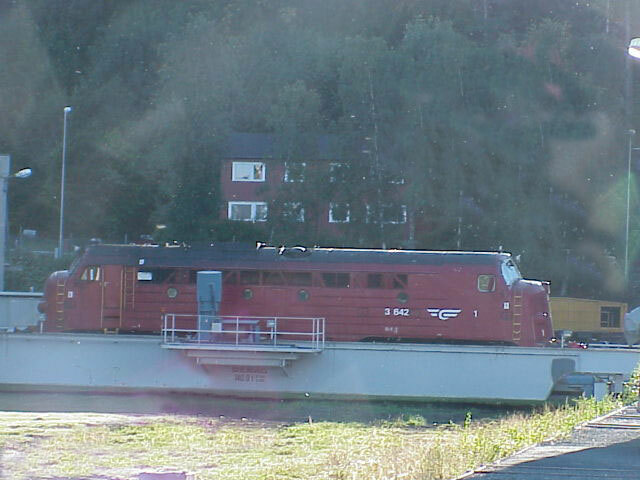 like this on Di3.631 on Kyllingbridge in 1999. I pulled to the site and heard a distant growling of the engine. I hastingly grabbed the camera, aimed at the bridge and got this shot. 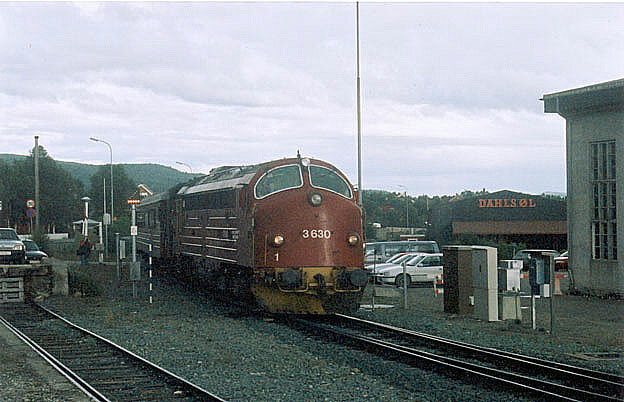 The three car consist of a BF and two secondclass cars of the B3-genertion was typical in the last days on Di.3 oprations. When I returned I saw two Di3.s growling with a rather freight up the grade but it was to dark to even take chanche to shoot that.... By the way, I happend to have a feature on the site on my webpage just click here. 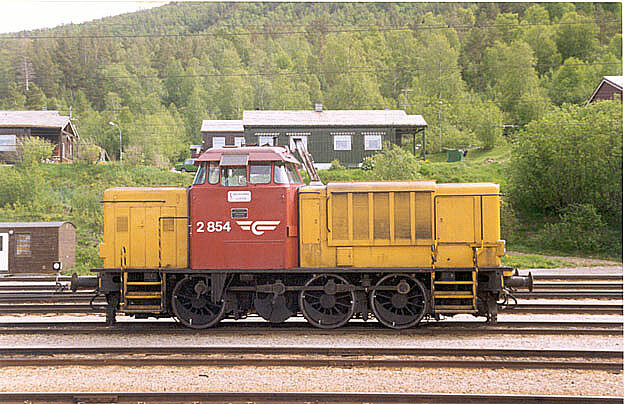 Back to Dombås where I found 3.632 sitting only a few yards away where the 3.623 was a couple years before. 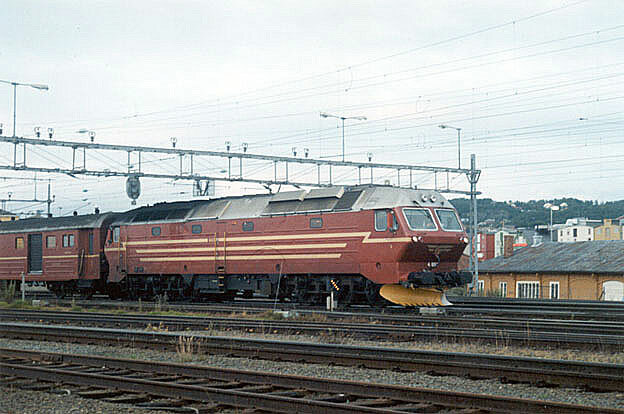 Not only on Raumaline Nohabs were common but aswell on the Rörosline, The Nordlandline and the Meråkerline from Trondheim to the Swedish border at Storlien. 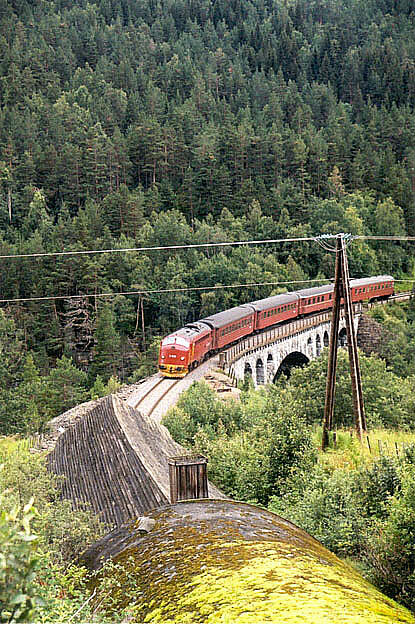 The Rörosline is a former narrow gauge line standard gauged by the German occupants during the WW II, and gives NSB an alternative route between Oslo and Stören, yet less busier that the mainline by Dovre. For 10 years ago these images on Di3b on a transfer table at the shops of the Marieborg terminal in Trondheim would be just a pair not so good images of just another Di3. But in september in year 2004 this is suprizing, as the unit should infact be in Kosovo. 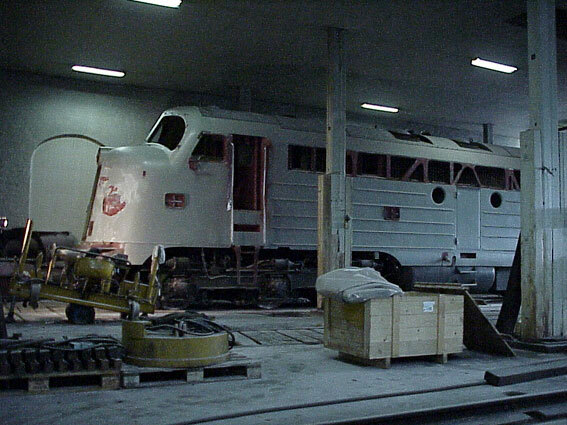 But sits there with NSB logo and all. 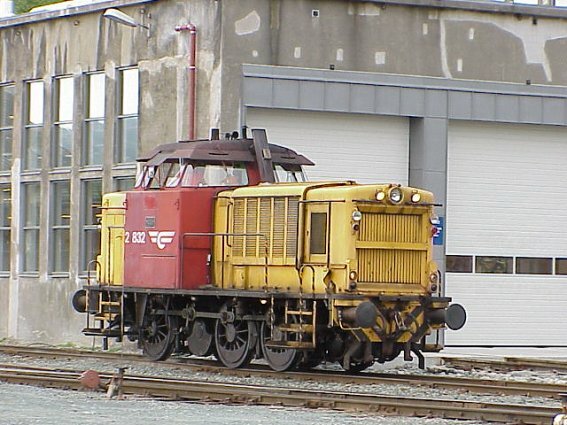 In June 2007 the Di3.642 is still in Marieborg engine terminal, but has lost its NSB lettering. The long hard night of work is over and Di 4 is rolling along to Marieborg for rest and attention. 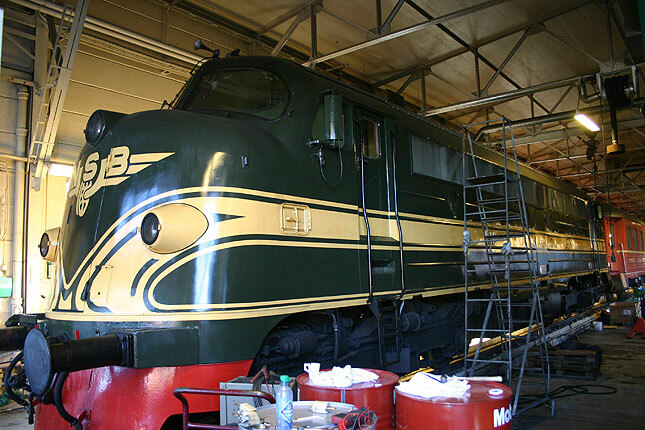 These impressive units are still units are wearing its original colors. 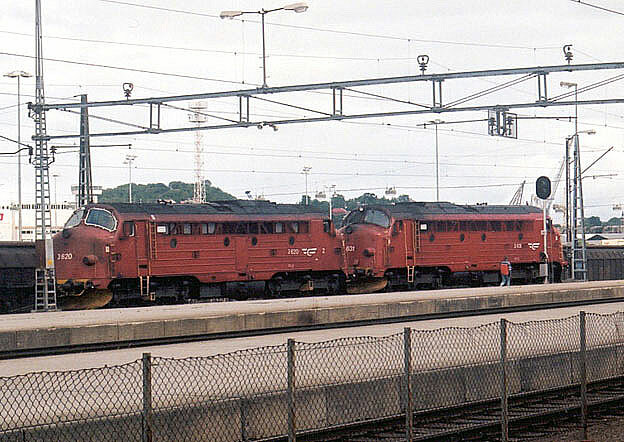 This variation was applied to Di 4.s and the first serei of the Swedish built El16.s, The electrics are however repainted to red and black and the units transfered to CargoNet are being repainted in to their classy dark gray and back scheme introduced by the stillborn NSB Gods (NSB Freight). 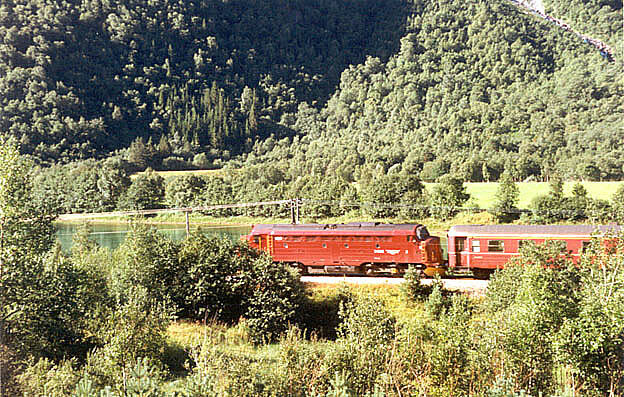 The handful of Di4 still solder on the Nordland line from Trondheim to Bodö. 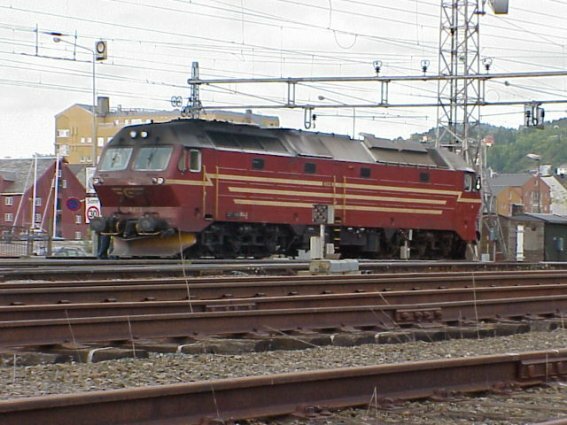 There were plans to order more units but never executed and when NSB desided on new diesel mainline power they ordered 12 new diesels of the illfated Di6.s. 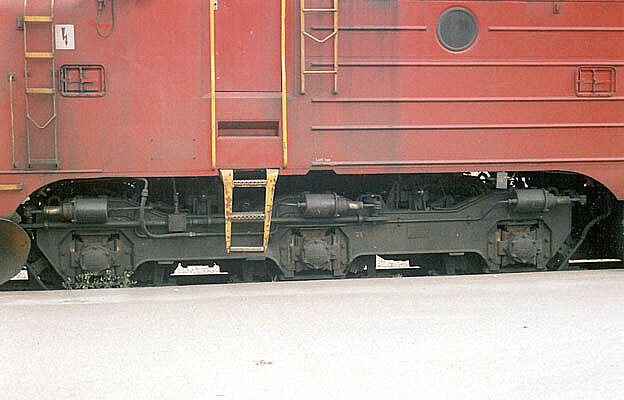 The Di6.s proved to be a total failure and after a coart settlement they were sent of to Germany, where they are used in leasing fleet of their manufactor Siemens. 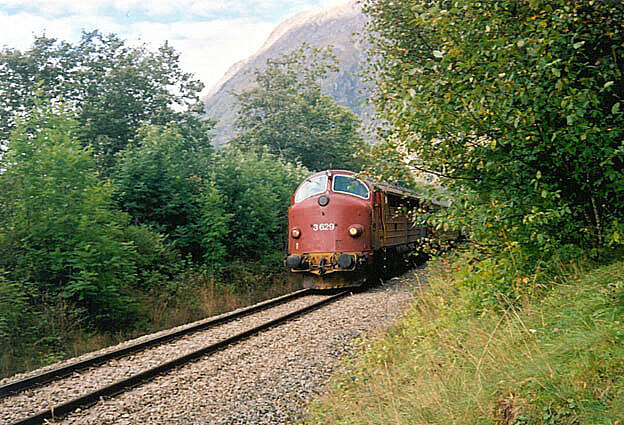 In 2004, the foursome of the units a re mainly used on passanger runs on Nordland line, while the locals and "Ole Tobias" train is handled by Talents. 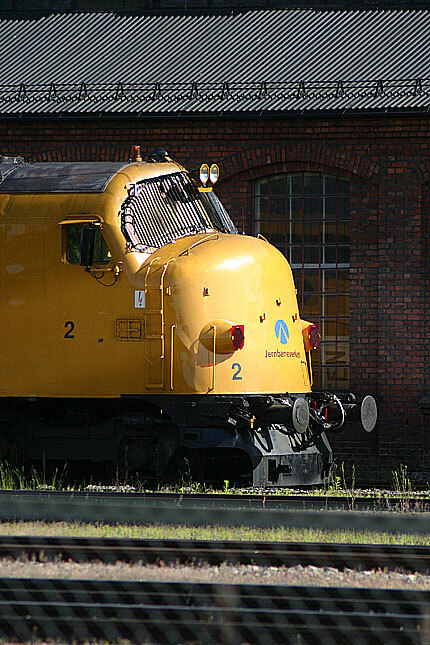 never the less this engine sits on side track of the Marieborg Engine terminal. date 1.st of September 2004. 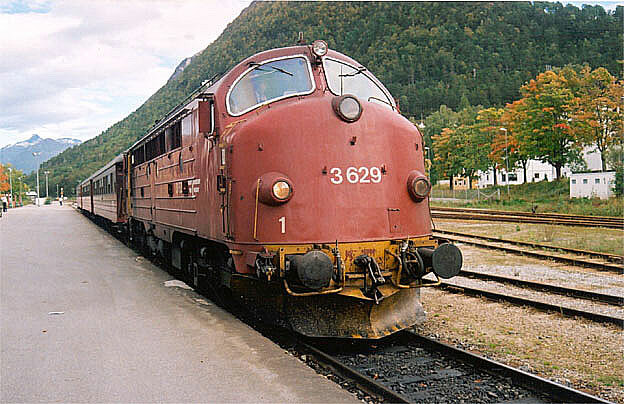 The handfull and powerful Di4.s are used on the Nordland line. 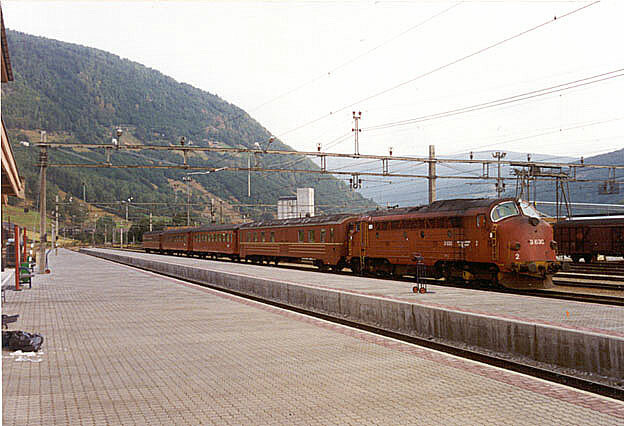 A side view of the same engine with the empty passanger consist. 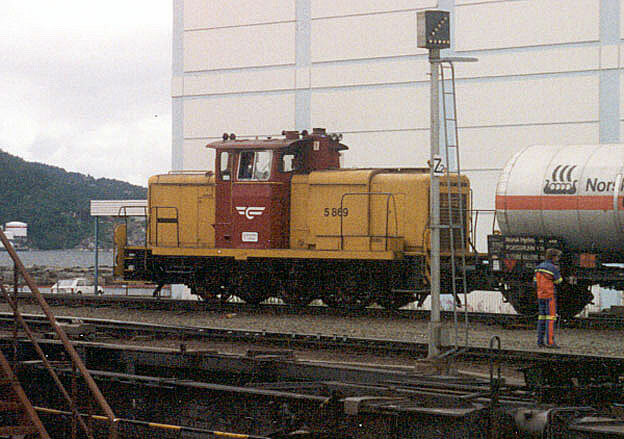 This version with additional stripes of the "old scheme" was applied to Di4.s and the earlier versions of El 16.s. 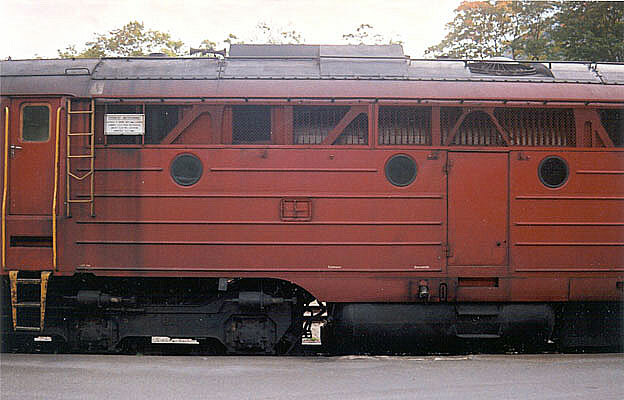 The E16.s were repainted to the current red and black scheeme while the diesels retained their orginal colors minus the modern insigna on the front. 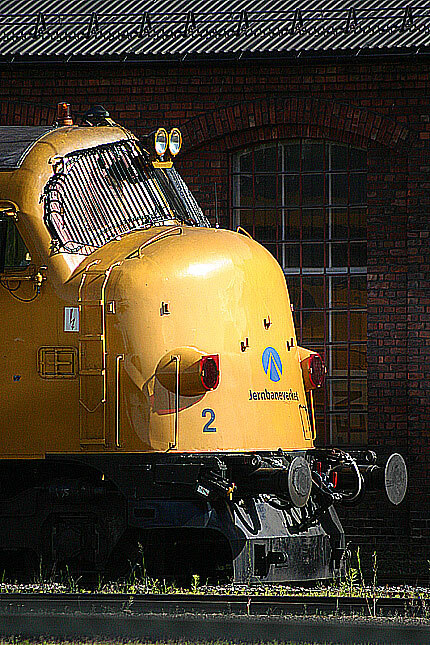 The stripes do give the impression of sleekness to these powerful diesels. 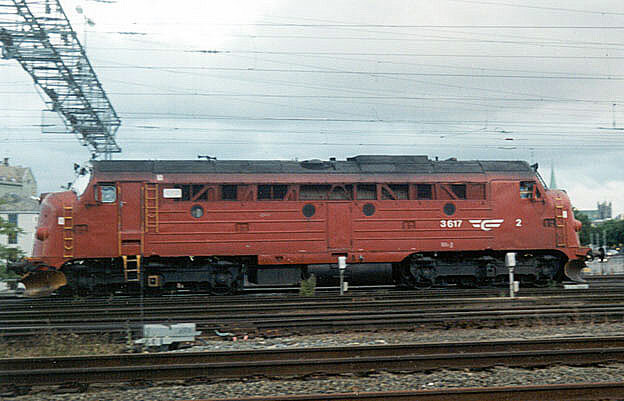 The largest of the diesels on NSB are the 5 engines of Di4-class (Di4.651-655). 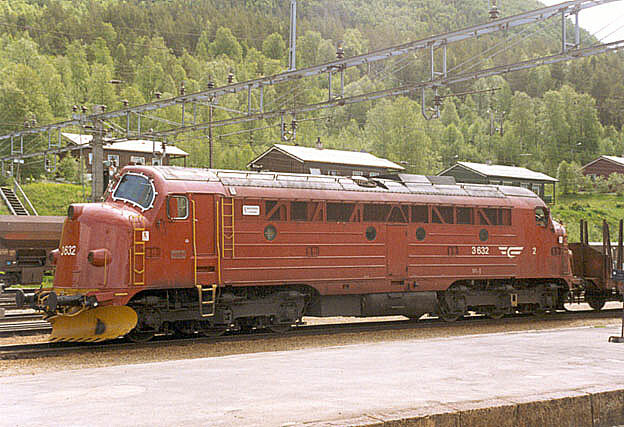 The engine could be more easily described as a EMD SD 50 in european double cabbed carbody, and are used on the Nordland line between Trondheim to Bodö. 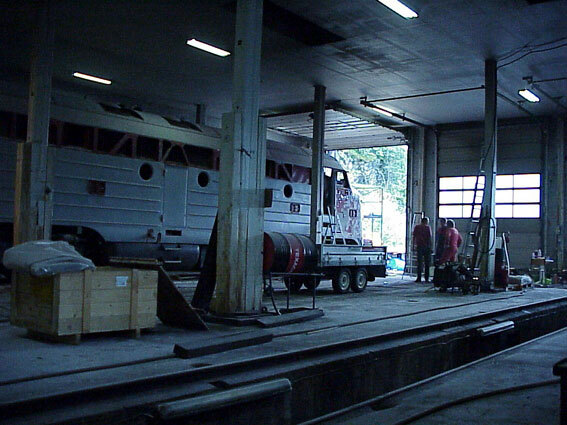 Note the baggagecar in "old sceme" with the baggage doors that are black confirming the later red and black scheme. 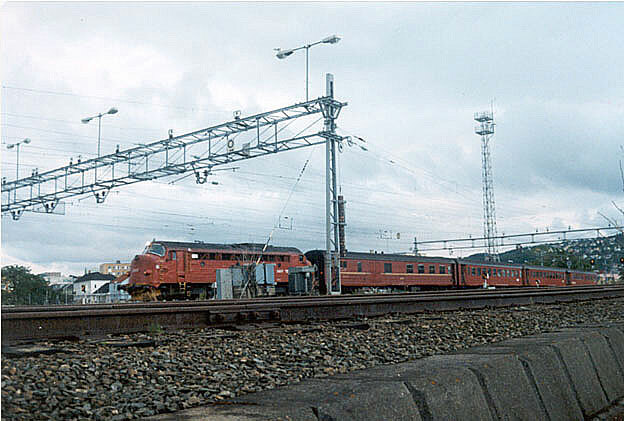 In the eighties, NSB needed new power bad. Money seem to have been tight, so they shopped a serie of secondhand V60.s from DB. 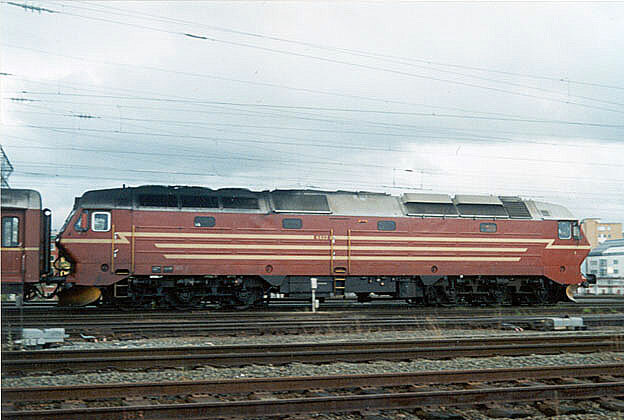 Also, they leased larger roadswitchers from NS and T44.s from SJ. Eventually they bought also a T44 and reclassified it as a Di7, which is after LKAB take over of the Iron Ore line back in sweden. 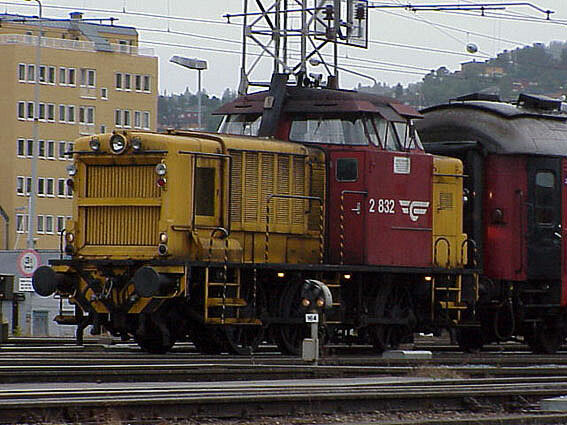 Today these Di5.s are scrapped but I catched this busy while switching the yard in Trondheim in mid 1990.s. To the third section, the critters!